There’s no bread, but I am grateful to the folks at Heinen’s for creating a sign with no spelling or grammar infractions only one spelling mistake. Today’s temperature is sitting around 20 degrees. Feels like the beach. Next Next post: Normal-Size Muffins are Anti-American? YES. I missed it. Dammit. Corrected. 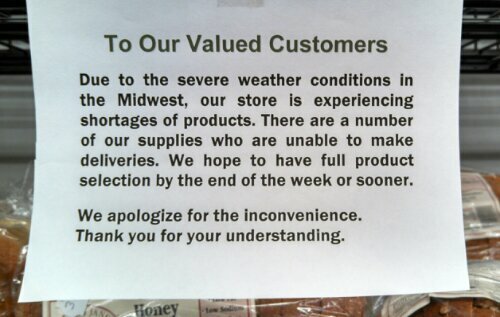 Heinen’s should do better! Their (“there”?) sign making is looking a little like their typical produce supply, from my experience more than 30 years ago.